I'm a great believer in going back to basics and looking at things with fresh eyes whenever I feel bogged down by my research. Looking through my grandma's family photo album again recently, I uncovered a previously unknown First World War veteran and a Salvation Army officer who travelled the world. 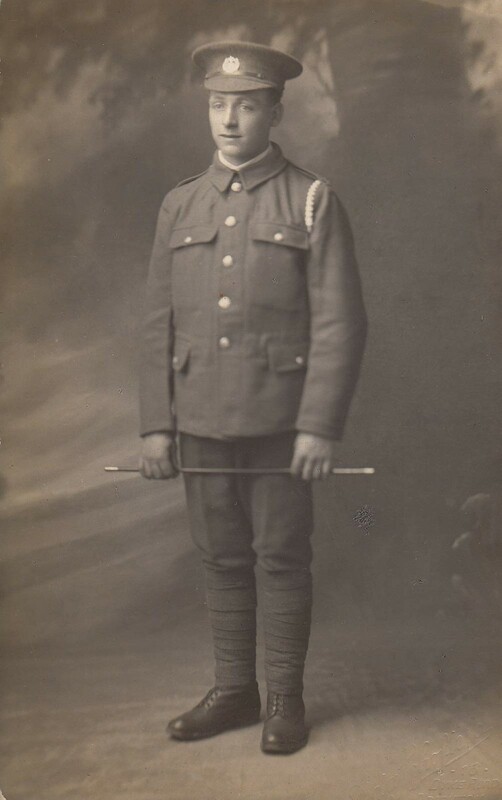 After careful analysis of the soldier's studio portrait, with the help of Findmypast's Medal Rolls and Honours collection and newspaper archive, it became clear that grandma's uncle Bill (William James Field) had served in the Essex Regiment and the Royal Engineers. But I don't know anything more. Did uncle Bill marry? Was the death registration I'd found in the Colchester registration district in 1982 actually his? Although I knew my granddad had an uncle who was in the Salvation Army, until I looked at Findmypast's travel records I didn't know his name, nor that he and his wife worked with people with visual impairments in Jamaica, Kenya and Nigeria. What happened to their daughter, Madge – my granddad's cousin? All I know, from her parents' Salvation Army "career card" held at the Salvation Army International Heritage Centre, is that Madge married in 1935 - but it doesn't say where or to whom. As I haven't found her marriage in indexes for England, Wales or Scotland, I suspect she married in Nigeria. But was she in the UK when war broke out? Uncle Bill and cousin Madge are just the sort of people that The 1939 Register is ideal for tracing. Where was this old soldier at the dawn of another war? I don't have Bill's birth certificate, so I can't search by date of birth, but he appears in the birth index as having been born in the September quarter of 1894. Using The 1939 Register's basic search, entering William J Field and 1894, I found one William J Field in the register, born that year, but he was living in Nottingham. The preview showed him living with someone called Gertrude Field – was this his wife? I wasn't sure this was him, so I searched Brightlingsea – where he was born – for all the Fields who lived there. I saw his siblings and his cousins, but not uncle Bill. Plunging into the unknown, I clicked to open the Nottingham record. This particular William was born in August 1894, which matches up with Bill's birth being registered in the September quarter (although watch out for babies being born in a different quarter from the one they're registered in). William was a postman – a slight career change from "mariner's apprentice" on the 1911 census – and was living in the same house as Gertrude Field. Making a note of Gertrude's date of birth, I looked for her in the death index, and her death was registered in the Colchester district, just as Uncle Bill's was. So at some point, the Fields moved from Nottingham to Essex. A little research on Gertrude showed that she was originally from Nottingham and it seems she and Bill had married there in 1919. Quite what an Essex boy like Bill was doing in Nottingham, I don't know, although it's entirely possible they met during WW1. I wasn't sure where Madge would be living in England – if she came back at all. I went to the advanced search, where you can enter the exact date of birth of the person you're looking for. Two Madges appeared when I searched without name variants, one of whom had middle initials, which my Madge doesn't. There was a Madge living in Solihull in 1939, which is just outside Birmingham, where I knew she had a family connection. The preview told me that Madge was living in a house with someone called Dora Stone, and that the records for three other people in the house are currently closed to view. I was surprised as I'd expected to see Madge living with her husband, but I wondered if he was overseas at the time the Register was taken. Perhaps Dora's husband was too? From the position of the redacted lines, it looks if Madge might have had two children and Dora had one. But who on earth was Dora Stone – Madge's cousin or her husband's relative? Now that I have Madge's married name, using the birth index I've identified two possible children for Madge, which gives me a new avenue to explore – and two new relatives I didn't know I had. I will be double-checking these records as best I can – my first move is to send off for the Fields' marriage certificate. When I jogged his memory, my dad remembered Grandma mention auntie Gertie, which makes me fairly sure I've found Uncle Bill and his wife. Matching Madge's date of birth exactly makes me confident I've found my grandad's cousin, and I've already spotted her on a passenger list, travelling to Nigeria in February 1945. She must've been a brave lady to make that journey alone during wartime. And I've found her obituary in a local newspaper – she died a couple of months shy of her 102nd birthday. 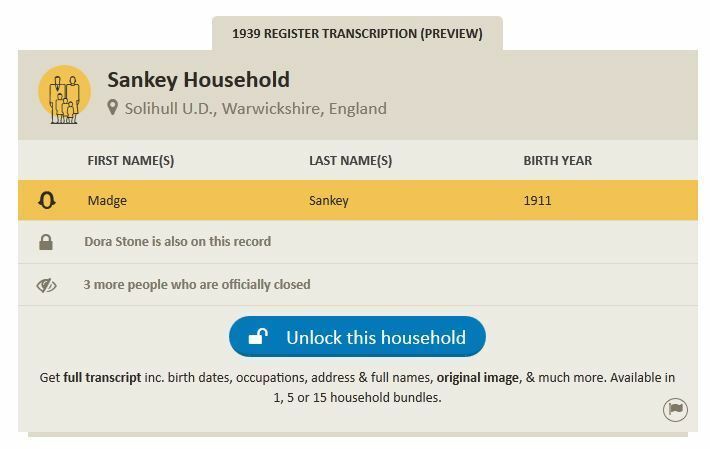 Without the 1939 Register these elusive relatives would have taken me years to track down, and in the end I found them in minutes. Read Next: An Intrepid Cocoa-Buyer, and Uncle Bill's Fate!